(Limassol, Cyprus)- The winter J/80 Cyprus Championship is an annual series of regattas hosted by SailFirst Sailing Club at St Raphael Marina in Limassol, Cyprus. Participation is open for both experienced sailors and novices as existing crews or individuals. Teams have often come from Cyprus, Russia, Ukraine and across Europe as this gorgeous “destination resort” is popular amongst eastern Europeans. 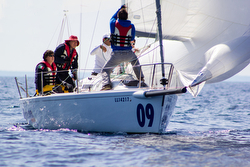 The regatta is run in three “acts” from January to March using the club’s fleet of a dozen J/80 one-design sailboats. The first event is January 21st, the second is February 18th, and the third is March 25th. All events have intermediate “training days” available for individuals or crews. The costs for sailing in this eastern Mediterranean resort are incredible reasonable- 350 EUR for an entire crew or just 70 EUR for each person on a boat for each stage. All-in for all three events is only 1,050 EUR for a crew or 210 EUR for a single crew person. NOTE- this is far less cost than chartering a J/22, J/24, J/70, or J/80 in any event in the USA or Europe. The fees include two training days, all racing and coaching, referees on the water and all boat maintenance. Watch this AnyWayAnyDay Cup Cyprus sailing video here to get a flavor of what it’s like to sail off Cyprus in the eastern Med. To learn more about Cyprus as a resort destination, watch this video here to get an understanding of the extraordinary beauty of this island nation. Learn more about J/80 Cyprus Championship here Add to Flipboard Magazine.